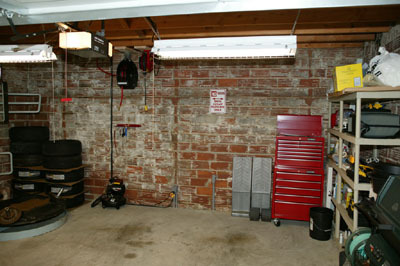 Here are some pictures of the garage I store and work on my car in. This garage started out as a total disaster, but I completely renovated it in the summer of 1998. You can see pictures of that project here. Since I purchased my BMW in September, 2002 I've been puttering around with it to customize it to my tastes. 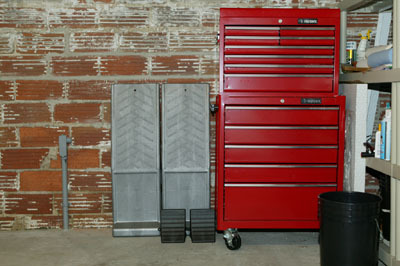 In that time I've collected quite a collection of tools and supplies, all of which are stored in the garage. I also have a tenant who keeps his bikes in the garage, along with an odd piece of exercise equipment and some less categorizable stuff (like a movie poster for "Nosferatu"). This view looks diagonally toward the right rear of the garage. From left to right, there is a pressure washer, two tool chests, two plastic storage shelves (more on this later), my hose, a barbeque grill (purchased in 1998 and never used, believe it or not), a set of 4 jack stands, my AC DK13HLQ jack, and a pair of Rhino Ramps. This is more-or-less "my side" of the garage. Note that the garage floor is over five years old and has no cracks. It does have some oil spots (when I'm traveling, my tenant keeps his beater car in the garage). In this later picture, I've moved the Rhino Ramps (and added matching wheel chocks) up to the front of the garage, to the left of the tool chest. This is the area where my tenant keeps his stuff. This view starts just to the right of the side door - the fire extinguisher and digital inside/outside thermometer are convenient to the door, as is the garbage pail. Aside from these, the only thing of mine in this picture is the air compressor, hose, and reel on the right-hand side of the picture. 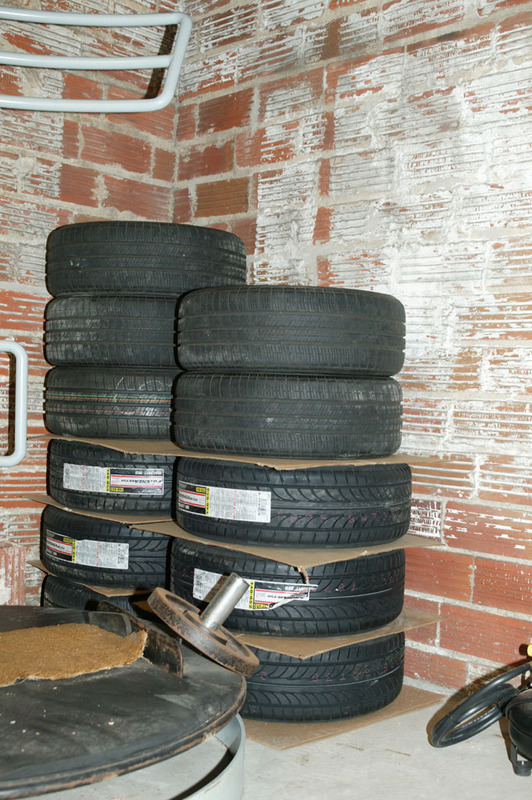 After some re-arranging, my tenant's stuff is closer to the side door and I now have room for my ever-growing collection of tires. You can also see that the garage lights have been replaced. The new ones are of the high-output type, which means they snap on instantly, even in below-freezing weather. I've also added wire guards to the lights, in case the lamps decide to fall out. And the air hose reel from the previous picture has been replaced by an overhead air hose reel and a matching electrical cord reel. This is my expanding tire collection. Currently, the car has 5 Blizzak LM-22 snow tires (4 on the car, 1 spare). On this pile are 5 new Potenza RE750 summer tires (mounted on Type 73 wheels), my 5 original ContiTouring Contacts (un-mounted), and one unused ContiTouring Contact (also mounted on a Type 73 wheel). I hope to be selling the 5 unmounted ContiTouring's shortly. This will give you a better idea of what sorts of supplies are on hand. Many of the items on the shelves are assorted cleaning materials. 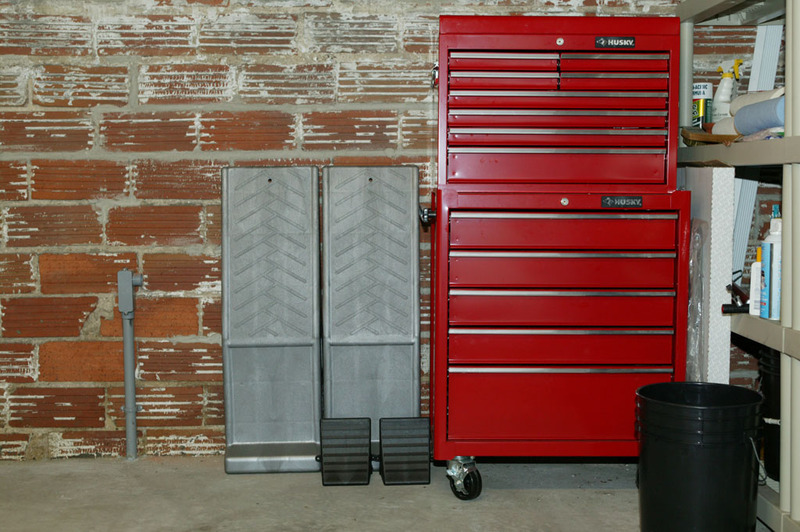 The tool chests contain a Home Depot 338-piece mechanic's tool set (not up to commercial mechanic's standards, but fine for the types of things I want to do). I've added organizers to the drawers to organize the tools into categories, and I've put all the sockets on various trees to keep them in order and at hand when I'm working. I've then added additional tools and supplies to augment this toolkit. The bottom two drawers of the lower chest contain miscellaneous BMW parts such as a cell phone eject box and trim, various electrical pins, sockets and connectors, and so on. Between the tool chests and the shelves is a white cardboard box which contains my "car show" floor mats (actually, I only change the driver's mat and leave the other 3 as delivered by the dealer), as well as a set of rubber floor mats for the winter months. To the right of the mats is a 5 gallon bucket which I used both for washing the car and to carry detailing supplies to car shows (all of the items I take to shows fit nicely in the bucket). Above the tool chest on the shelves, the red bag is an EMT-style first aid kit which I used to keep in my '95 Eagle Talon. 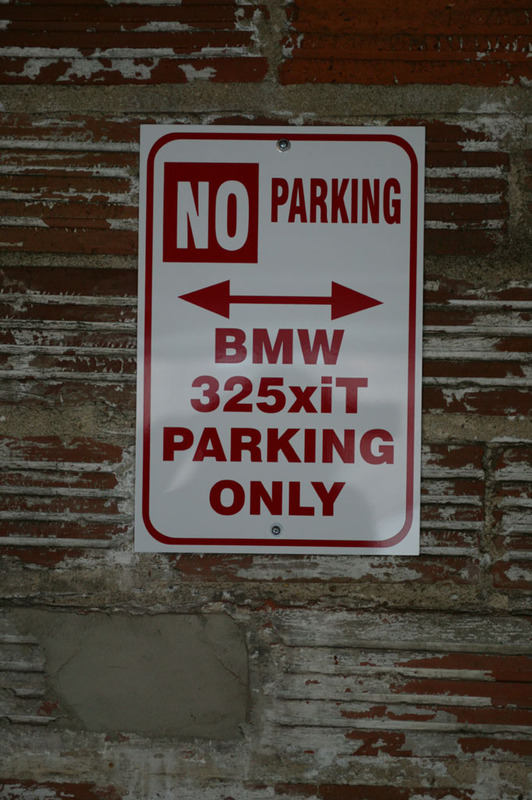 Since I installed the BMW first aid kit in the wagon, this has been staying in the garage. To the right, the "deer crossing" sign is packaging from a spare deer whistle (see my BMW page for more details). Moving upwards, the top shelf contains some bags of microfiber towels from Vapor Clean Products as well as boxes (behind the towels and out of sight) with the original side view mirrors, wood trim, handbrake, etc. from my BMW projects. In front of the right-hand shelves is a spare Type 73 wheel and tire. This is a second spare which used to be on the front right of the car before it had a run-in with a pothole that destroyed the tire and bent both flanges of the wheel. I bought a new wheel and tire and had them assembled at the dealer (by the way, you get some strange looks when bringing a wheel and tire home on the subway). Later, I had the bent wheel repaired at Wheel Collision Center and a matching new tire mounted on it. This way I'm ready for the next crop of potholes. Behind the tire is a shelf with a battery charger. Hiding behind the tire where you can't see it are some jugs of windshield washer fluid and distilled water. The next shelf up has some cleaning products (BMW wheel cleaner and leather cleaner), some spare BMW motor oil, and some glass cleaner. The motor oil should really be on the bottom shelf; I'll move it later. To the right is a box with my original steering wheel, some tool bins, a fender protector and knee pad. Moving up a shelf, we have my Bentley manual, a California Car Duster and a BMW folding chair (used at car shows). On the next shelf there are more cleaners (spray bottles with custom preparations of assorted Zaino products), a Bonair hose nozzle (from Home Depot, similar to the Griot's Garage Ultimate one but a lot less expensive), a vacuum, and the BMW Coolbox (a 12V Peltier-effect refrigerator for the car). The top shelf has a carton holding a replacement BMW door frame gasket. For some reason on the BMW, the way I am used to getting out of the car - open door, unlatch seatbelt, and exit in one fluid motion) causes the seatbelt latch to flail out and chop pieces out of the door frame gasket. I've never had this happen on any of my other cars, and it took me some time to figure out what was happening - I initially reported to the dealer that there was some strange black fuzz on the floor by the driver's seat belt retractor. They couldn't figure out what it was (Duh!). When I was detailing the car, I was shocked to find the door frame seal was chopped up enough that I could see into the hollow spot in the middle of the tubing. I changed this gasket once and am working to break myself of this habit, but I got a spare just in case. Above that are some cotton towels in a bag from Bed Bath & Beyond, a bunch of rags-in-a-box, and some larger spare parts for the car. To the right we have the hose and reel (the water tap is on the side of the house, so I have to reel the hose over to the house when I want to wash the car). Next is the gas grill, which I have never used in the 5 years I've owned it. In fact, the propane tank has never been filled and I think it is two revisions of the "mandatory tank modification for safety purposes" out of date at this point. It does make a handy stand for my Bentley manual or notebook PC when I'm working on the car, though. Right now it has two of the trunk organizer inserts for the BMW on its shelf. These organizers are identical though they bear two different part numbers, and neither of them actually fits in my car. I ordered the car with a full-size spare but the dealer lost that part of the order, so they gave me the wheel and tire when I picked up the car, but the hardware is for the donut spare. I'm still trying to find the proper inserts and hardware for the spare tray but haven't been successful yet. Heading off to the right is a gaggle of jack stands (well, only four of 'em) hiding under a plastic chair. Continuing to the right, we see the chair and jack stands again, as well as an AC DK13HLQ jack. If you do any sort of work on your car, even just changing the wheels and tires from winter to summer ones, you want a real jack - the jack in the car isn't really up to the task and I've never felt safe using the jack that came with any car. The AC jack is a bit of overkill for my needs, but I figured I'd treat myself to a good one. To the right of that are a pair of Rhino Ramps. Most of the time when I need to get under the car, I drive up to a gas station where a friend of mine is a mechanic and put it on the lift. But for a quick project under the car, the Rhinos come in handy and save me a trip out of the city. When I had the '95 Eagle Talon, I used to check my tire pressure at home and then fill the tires (if needed) at a gas station about 3 blocks away from my house. The only source of air I had at home was a bicycle pump. Also, at that time I was parking the Talon outside the garage (look at the garage renovation pictures and you'll see why). Some of the local kids let the air out of all 4 tires and I had to pump them up enough to limp to the gas station for a full inflation. The amusing part was that I had to do this when I was leaving for an appointment with my cardiologist. I wound up having to explain to them that I didn't always seem this blue and out-of-breath... Anyway, the next day I went to the local auto parts place and bought one of those cigarette-lighter-socket-powered portable air compressors. After trying it out, I brought it back and said "This is a joke, right?". They gave me another brand to try which worked better, but always sounded as though it was 30 seconds away from having a major breakdown. When I bought the BMW wagon I decided to get a real compressor. I went to my local Home Depot, but they were out of stock on the one I wanted. Likewise for 3 other Home Depot stores and the only Lowes near me. I wound up ordering this compressor from Amazon and I'm very pleased with it. In fact, I've been ordering a lot of tools from Amazon lately, since the Home Depot / Lowes / Menard's stores all seem to have cut way back on their selection and quality. Initially I just wanted the compressor for tire inflation and compressed air dusting, but since the compressor wound up being surprisingly powerful, I ordered a 1/2" Porter Cable impact wrench from Amazon. After a couple times of jacking up each wheel to remove the wheel and clean the brake dust off the inside of the wheel (important for car shows), doing it by hand lost any appeal it might have had. I still tighten the lug bolts to BMW specs with my torque wrench. All the stuff to the left of the compressor belongs to my tenant. I think the WD-40 and Liquid Wrench are for the exercise artifact that is out of this picture to the left. I got tired of dealing with un-coiling and re-coiling my air hose, particularly in the winter when the PVC of the hose gets really stiff. So I purchased an air hose reel from Griot's Garage. I added an inlet extension from Grainger (air hose reels only seem to come with a 3-foot inlet hose, on the assumption that you're going to run black pipe to where the hose reel is). Next to it is a Reelcraft L-4545-123-3 cord reel, which I purchased from Amazon. I felt that the ones offered by Griot's Garage were too cheezy, and I wanted a better one. Below the cord reels is a Rapid Reel 2001.078 air tool tray. This is not the one from Griot's Garage, which only works with their non-standard air couplers. This one works with industry-standard couplers, and is made by the same company that makes the one Griot's Garage sells. 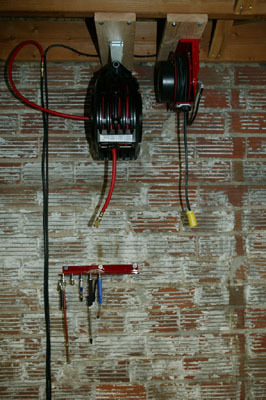 Hanging from the tray are an assortment of tools - two tire inflator chucks and three types of dusters. I have an impact wrench and orbital polisher, but they are too heavy to hang from this rack. Here is a picture of my air tools. In the foreground are a pair of tire inflators (one stubby, which I let my tenant use for his motorcycle, and one full-length one with built-in pressure gauge). In the middle to the left is a blower nozzle which I used to blow any leaves or other debris out of the engine compartment. To the right is the impact wrench. The Home Depot 338 piece tool set does come with a set of black impact-rated sockets, but I purchased some Grey Pneumatic metric sockets as well. These are somewhat thinner-walled than the Home Depot ones and should work even on aftermarket wheels with reduced clearances for the lug bolts. 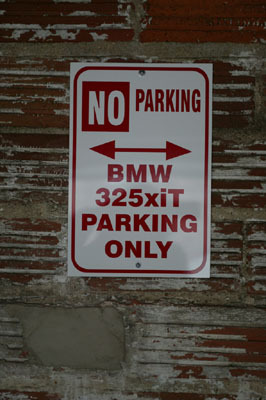 In my assorted car projects, I've amassed a good assortment of small BMW parts. Whenever I need a clip or screw, I order a dozen or more of them so I have extras on hand. This is one of two parts boxes. This on contains various plastic clip pieces, mostly for interior trim. A companion box has the metal parts, mostly screws, clips, and nuts. Accessibility Policy This page last modified on Monday, 02-Nov-2015 23:01:58 EST. So, what's a glaver anyway? 1 hit this week, 56280 since 9/15/2003.